So you want to farm? Many people read farm blogs because they have an interest in farming. A lot of people think about getting closer to their food, or being self-sufficient, or have a vision that includes a homestead of their own, and I talk to a lot of them, both in person and via this blog and other writing I do. If you'd like to farm, here's the way that I suggest you do it, based on my own experience, and having looked at quite a few farms that have failed, like this one, or this one. Start small with a "proof of concept"
Start small. Get 30 hens, build a coop, and do the husbandry thing for 6 months or a year. Don't quit your day job, don't spend a fortune. Just try it out. Keep careful records of what you spend, and how much time it takes, and what sorts of revenue you could get from it, and make an appointment with yourself to review what you learned. Mark it on the calendar. Realize that washing 2 dozen eggs a day is a different chore than washing 200 dozen eggs a day. If you have some sort of idea that is going to revolutionize agriculture, that's great! Just try it on a small scale, and be open to changing your view or practices as you gain experience. Slow down: That's why country life is attractive, right? Think about your farm as a 10 year project. It's more a lifestyle than anything else. Let things progress as they may. Seasons change. Relax and enjoy the ride. You don't need to have a fully functioning farm tomorrow. Make a transition plan, and remember to do a proof of concept for the major parts of your venture. One farming couple built a reasonably large farm, claiming to reach a half-million dollars in revenue, but somehow along the way they forgot to file their IRS schedule F, which is profit/loss from farming. That couple found out that in order to qualify for some very attractive financing that the government requires you to have farm experience, and they measure that by your filing schedule F. I don't know how they were accounting for their income, or whether they were paying any taxes at all, but I do know that when they tried to get a loan they were denied because they had not filed this form. They lost the lease on their land, and they lived in an RV for a while after that. Probably not what they had in mind when they started their farm. The government, and it's the USDA in particular, offers very nice financing options for new farmers, but you have to pay your taxes to qualify. There's good reason to accurately report your income. Don't disqualify yourself from this financing option like this couple did. This is a true story. It's pretty popular for folks who are starting a farm to have ideas on how things should happen. Husbandry ideas, or fertilizer, or organizational stuff. That's all good, and often a person with a better idea can make something happen. But remember that we as a species have been growing food for a long time, and that an idea can still be good no matter what the source. So it's worth your while to look carefully at how things are done on other farms, and to realize that there's a reason for everything. This is very important. I'm going to say it again: No matter how wacky some farmers practice might seem, there's a reason they're doing it. Take the time to learn why that is. This applies to conventional farms, too. there's a reason that they do things, and even if you disagree with them, do take the time and figure out why they do that. You can then avoid it if you wish, but you may find that there's a good reason and 50 years of experience backing it up. Always trust what someone does, particularly if you can visit the farm and see them do it. Conventional farms have a lot riding on being efficient in their operations and that can be worth studying. Not every conventional technique is evil, and a lot can be learned from people who make their living producing food. Be skeptical about the Internet and self published authors. Anyone can write anything they want on the Internet. Anyone can write whatever they want and pay about $800 to have it printed up. Instant author. When I've called out people who I think are promoting harmful practices, or claiming to be able to do something that I think is just impossible, I've been a little surprised at how angry OTHER people get. Look, if you read somewhere that pigs can be raised on just the smell of baking bread don't go out and buy an oven and a mixer. It just ain't true, folks. And don't get mad at me when I tell you it isn't true. Try it yourself, small scale. Get your bread machine and your fan and see if it works with a couple of pigs. But weigh them, and be ready to stop if they don't gain weight. NEVER TRUST ANY SINGLE SOURCE OF INFORMATION, no matter how nice the people providing it are. This is your farm, and it's your money. Try it for yourself before you go all-in. Be kind to the animals if your venture involves them. If your venture involves animals you will find that some of them will probably die. And if you're unlucky, lots of them will. If you find yourself over your head with an animal, do the right thing and solve the problem. Solve the problem: Immunize. Vaccinate. Call the vet. Administer antibiotics if it will save the animals life. Make the decision to put the animal down. If the treatment of the animal or the food it requires means that it doesn't fit into your farm, that's fine -- sell it to some other farm that it does fit into. Don't wait for it to die of starvation or a preventable disease or parasites. Watching an animal die when you could prevent it is not a new concept, or admirable. It's just plain cruel. Now that's not to say that it's avoidable, either. In any farming venture you will have times when things just do not go as planned. I had a bunch of nice turkeys manage to drown themselves in a 5 gallon bucket with 2" of water in the bottom. I sure could have prevented that if I'd known, and to this day I turn the buckets upside down when I see them. I don't fault a new farmer, or an old farmer, for that sort of thing. But if you're having problems, swallow your pride and ask for help. The animals will appreciate it, and you'll learn, too. Feed raw milk to babies? Tim and Liz Young, over at naturesharmonyfarm.com, have a particular farming style that, frankly, fascinates me. They're pretty dedicated to promoting it, which is interesting, too. As near as I can summarize it, it's "buy a bunch of animals, turn them out, and whatever survives must be the best of the lot". I'm fascinated because it's, well, amazing to me. I can't think of anyone else who does that sort of farming. "Survival farm"? I'm still looking for a good term for this farming approach. One of the reviewers of his book on Amazon likened it to abandoning animals. "abandonment farm"? I don't know where they got this idea; while they talk a lot about Joel Salatin and other farmers, no one else does this with their animals and property. It seems to be a Tim and Liz thing, and from that respect, it's interesting to me because it's novel. Sort of like a figure-8 race; you watch it for the crashes. Figure 8 racing, farming style. I tried "darwin farm" for a while, but it really doesn't have anything to do with evolution. I do have to give them every credit though -- they apply this philosophy everywhere. Turkeys eyes popping out and dying in bunches? too bad. Dairy cows croaking? Sorry. Sheep dying from parasites? So sad. Want to have some fruit trees? They plant lots of extras so that when they die they'll have some left. Absolutely consistent. Buy lots and hope that some survive to be used. I guess if you have money to burn you can do that stuff; near as I can tell they've spent the better part of a million bucks chasing their farming fantasy... err... dream. "Heck, we had to search for a bit to find a pediatrician who didn't spin her head when we confessed (hushing our voices in embarrassment) that we would likely feed a raw-milk formula to our baby"
Apparently they talked to many doctors who did not support this at all. Now why would doctors not support feeding raw milk to infants? Well... how about kidney failure and lifelong dialysis? Or just plain old death? What chance of death is acceptable for your child? "...Chris picked up E. coli from a tainted batch, a state investigation concluded. His kidneys failed, landing him in the hospital for two months. Now 13, he is off dialysis, but doctors aren't sure whether Chris' kidneys will hold out. "It was the shock of a lifetime," his mother told me. "If not for modern medicine, he would have died." The milk in that case came from a large dairy, but it happens to small dairies as well. In an outbreak earlier this year in Oregon at Foundation Farms, 15 children were involved, including 4 of the farmers own children. Germs don't know whether the farm is small or large, and I'm sure that the farmer at Foundation Farms took every sanitary precaution, as I am sure Tim and Liz will. Liz said it best, I think, talking about planting lots of fruit trees figuring that some or most would die: "It's the same approach we take for everything. the things that are meant to grow and do well here will..."
So I said they were consistent, right? Cows, sheep, turkeys, trees... infants. The last time I wrote about food stamps I didn't talk about what the food stamp benefit actually is. For a single individual, it's about $29 a week. If you're on food stamps, you need to feed yourself on $29 a week or less. The major of Phoenix, AZ did that this week. He lived within the food stamp budget, and found it pretty informative. That's the thing about food stamps. I don't think that people sign up for it because of the easy living -- I think they sign up for them because they need to live. Mitt Romney, in his "47% won't vote for me" said that he felt that people weren't entitled to food, and other stuff -- see the link. I disagree. I think that people who work and try and strive are worthy of support, and I appreciate the people who do. But I'm not going to let someone go hungry. The most frequently hungry are the children. And even if the parent is a deadbeat, I'm going to say that feeding a deadbeat is worth it to get the children fed, too. Yes, some folks sell food stamps for $0.10 on the dollar -- which means that they can reap a whole $3 off their entire weekly food budget. That's another issue, and it's usually drug related, and there are other solutions to that than deny hungry people food. Stephen emailed me a link to a news story about cattle farmers feeding surplus or discarded food to cows this year, mostly prompted by the drought in the midwest. We discard more than half the food we produce, and I'm all for using a higher percentage -- heck, ALL of it! -- instead of just tossing it into the landfill. Mind you that I'm going to make compost out of it, too -- but I'm going to put it through a pig first, to get the best and highest use of it. They're talking about feeding marshmallows and gummy worms to cattle -- I prefer a more natural diet of fruit and vegetables, but to each their own. This is one of the things I produce on my farm. It's a pile of compost; roughly 1/3rd manure and 2/3rds tree chips, carefully aged and turned, and now it's ready to go. This is pretty great stuff for growing things; it forms the base of our greenhouse soil, and we use it as an amendment in the pastures for low-fertility areas. In this operation we're moving about 300 cubic yards of compost, 5-6 yards at a time. We'll usually apply it at 4-6" deep whereever more fertility is needed. The underlying soil type on my farm is clay, and we've got patches of blue clay that surface here and there. A little plowing, some compost, and then smoothing down means that we get good growth instead of a bare spot of clay in the pastures. It's funny, but this stuff is heavily, and I mean heavily, regulated in Snohomish county. I looked into the possibility of bagging and selling it, or selling it in bulk, and found that the permit costs alone for retail compost sales were in excess of $10k a year. That's just the permit fee for one set of permits -- you may be required to get several permits or licenses. "Bailand Farms president Don Bailey said one of the factors holding his company back is the high permitting cost. Every year, he pays about $10,000 for two permits, one for handling solid waste and another for air-quality "
So we skip the fees and regulations and just use our lovely compost on our pastures and gardens directly. I sure would hate to see what would happen if the county wasn't encouraging composting. Maybe they'd just take us farmers out and shoot us. This is the mean white-faced pig. So named because she is super protective of her piglets. So much so that it's actually pretty difficult to work with her. She weighs around 500lbs, and is a pretty good mother. We normally have move the sow into the barn for farrowing -- at this time of year it's no big deal to do pasture farrowing -- it's warm and dry -- but in the barn we have a chance to watch the litter and make sure that things are ok with the sow as well. We also lose fewer piglets due to mom laying on them, or predators, or weather, or all of the other things that kill small pigs. We had her in the barn, but she broke out and made her way into the bushes, were we found her the next day. "oh, he brings the food" list. She's happy about the food while she eats it. she likes the food bowl; it's a happy thing for her. She'd like to take it back to her nest, but then remembers that I might be a piglet predator, and drops it, putting herself between the piglets and me. I creep a little closer to get a count, and look at the pigs condition. All seem fine. It's actually a pretty good setup. There's a log back there that allows the pigs to get under it and be safe from mom squishing them when she lays down. Good deal. five, six. A small litter size, but typical for my berkshire sows. They all seem skinny -- they were born yesterday, and that's how they look, but they're active and alert and nursing. So far so good. Goodnight, mean white-faced pig. Sleep well piglets. Piglets are just babies, after all. 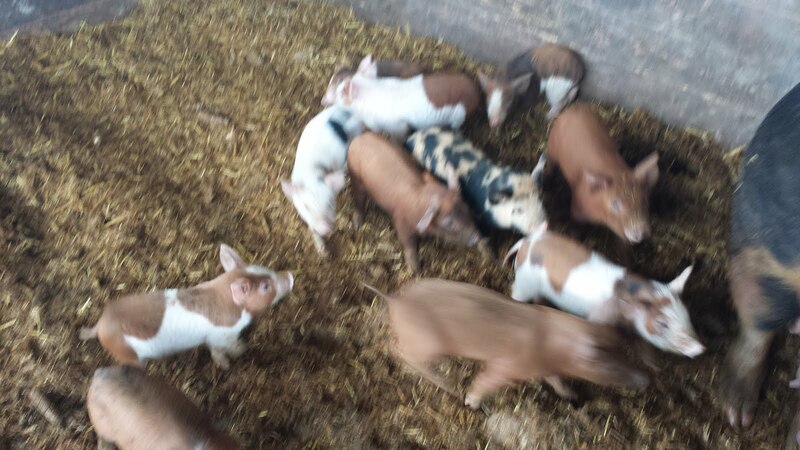 Part of the fun of piglets is watching them learn about things. We've just come through a pretty dry spell - about 40 days of no rain, and very warm temperatures (for Seattle, anyway), and the piglets that were born just before this or sometime during this have never seen rain, or felt it. So it's pretty fun to watch them when it rains. They feel the rain drops hit them, and spin around to look behind them -- it must be another pig that is doing that! but it's not! and this concerns them a little -- sometimes they'll grunt, or more often squeal, and sometimes, if they get themselves worked up about it, they'll get the whole litter to run around until they find out that if they stand under something, it stops. but... you can put your mouth on the water, and it tastes interesting. you'll see each piglet thinking it through as they lick their lips and scramble around. After a while, they'll all decide that whatever this new thing is is pretty harmless, and they'll usually go take a nap until the rain stops, in a softly snoring pigpile. I watched this little go through this, and made sure that the bedding was dry, and that the food and water were working. I check them a couple of times a day, the little ones, because they can get into trouble, but trouble is infrequent, and I like watching the little ones. It's hit the headlines that food stamp use in the US has hit record levels, and it's very popular to bash the program, but in general, if we're going to spend billions of dollars, I'd rather it be on cheese than bombs. "...who wouldn't trade a middle-class job, a car and a house for $300 a month in food stamps, a tiny apartment and a bus pass? I hear people are abandoning their jobs right and left to sign up. " let's be clear here: I was poor as a child. Welfare poor. Food stamp poor. I remember that time as being one of hardship and privation. My mother saved and scrimped food stamps for 6 months so that she could buy my sister and I an ice cream one day, and was reduced to tears by a woman who criticized her for "wasting" the food stamp money. That was the only ice cream we saw that whole year. Yes, we may be wasting some money, and maybe folks are getting food stamps that don't qualify. But the vast majority of people who receive them desperately need them. I know my family did. We have spent 1.3 trillion dollars on the wars since 2001, and we will spend another trillion dollars in caring for our troops after the wars. In that same period we have spent less than one half of 1% of that sum on food stamps. Can you really say that any of that money is "wasted" if it goes to buy food?